We’re Robinson Hill, and what makes us unique is our focus on creating delightful guest expeRHiences. 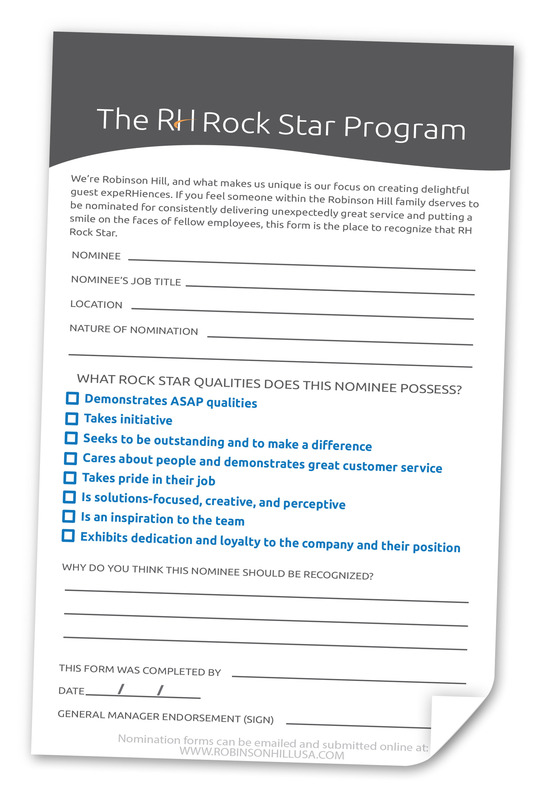 If you feel someone within the Robinson Hill family dserves to be nominated for consistently delivering unexpectedly great service and putting a smile on the faces of fellow employees, this form is the place to recognize that Robinson Hill Rock Star. Once you’re finished, just hit submit! Why do you think this nominee should be recognized? If you’d rather print out a form and fill it out by hand with your supervisor, please print this PDF below and email the form to admin@robinsonhillusa.com.